For centuries, artists have used tools to help improve their art. Technologies have vastly improved since the invention of the pinhole camera or camera obscura, which was used as a drawing aid by 15th – 17th century artists. Hundreds of years later, artists like myself are still exploring different tools to help advance our art and art businesses. Recently, I have been enjoying the popular mobile photo apps Instagram and Pixlr-o-matic. These photo-sharing apps allow users to snap mobile photos, apply digital filters and effects to it, and then share it via their social media channels including Instagram’s own site. Pixlr-o-Matic can be used on your phone or accessed on your computer. Now any iPhone or Android or computer user can become a creative photographer! The results are reminiscent of the old Polaroid transfer or print making techniques. This new photo process can be quite fun and addicting, but I primarily use these apps to help boost my art business. 1. Artistic inspiration. These apps literally offer thousands of variations of filters and effects for each individual image. Now, when I feel artistically uninspired, I can find an interesting photo on my phone or computer, and play with the many different filters until I find one that moves me. As a painter, these apps have helped me discover new techniques, and effects to use in my oil paintings. Not only do these photo apps help inspire my recent paintings, but they also help provide me with interesting blogging content and photos to illustrate posts on my blog, FineArtTips.com. 2. Test the Composition. I use Instagram as a helpful testing tool. I monitor the popularity of my uploaded photos of possible painting subject matter and composition. I can easily examine the popularity and statistics using the Instagram app, Statigram. Below are my latest top 5 images. 3. Branding & Marketing. Instagram and Pixlr are another free branding and marketing opportunity. Show the world who you are = branding. I share my interests, and some personal photos. Show the world what you do = marketing. I share my latest paintings and details of my art or works in progress. 4. Social Media Cross-Pollination. I use both Instagram and Pixlr-o-matic to cross-pollinate my social media channels. I tweet a few of my Instagram photos each day. 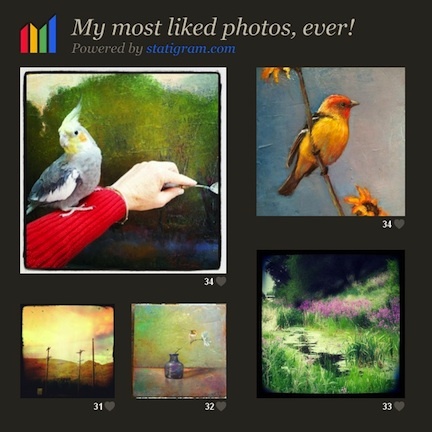 And I have also added a tasteful Instagram feed tab on my Fine Art Tips Facebook Fan Page. I use another helpful app, Pingram, which combines Instagram and Pinterest. Here, I can “pin” my favorite photos to Pinterest and easily browse my Instagram feed. 5. Networking. Instagram is another social networking channel. However, I use it a bit differently than Twitter, Facebook or Google Plus. To lessen my social media overload, I have decided to use Instagram primarily for my own personal enjoyment, artistic inspiration and experimentation. Nevertheless, I have to admit it is fun to see the creative side of many of my Twitter and Facebook friends! Don't miss your chance to win a Kindle Fire. Each comment, Tweet and ReTweet of a Benchmark FTW post gives you a shot at winning. Check out the full details on the Benchmark FTW series and contest. I've read that customers are more likely to make a purchase, if they come through a social image site like Pinterest. Combining tools like these should only boost that! Lori...do you plan to use Facebook more if they integrate Instagram into the site more? I use Instagram for personal use, but how can I apply it as a marketing tool for the business? I don't see how I can set up an account through the website... I think I'm lost..